For this episode of MOCRA Voices, MOCRA Director Terrence Dempsey, S.J., and Assistant Director David Brinker talk with Israeli artist Archie Granot and American collector Max Thurm. Thurm and his wife Sandra commissioned a body of work from Granot titled The Papercut Haggadah, which was displayed at MOCRA in 2012. They discuss a range of topics, including how Granot was drawn to the art of papercutting, how the commission came about, the special considerations engaged in creating an artwork based on a sacred text, and continuity and innovation in the Jewish tradition. Archie Granot was born in London in 1946 and moved to Israel in 1967. Prior to settling in Jerusalem in 1978, he was a member of an agricultural community where he milked cows and grew melons. He earned a M.Phil. in Russian Studies from the University of Glasgow, Scotland and a B.A. in Political Science and Russian Studies from the Hebrew University, Jerusalem. Granot started papercutting in 1979, and currently has his own studio and gallery in Jerusalem. Many of his papercuts carry a reminder of the Holy City, a source of his inspiration, and he often employs texts that relate to Israel, Judaism, and Judaica. Granot has had solo exhibitions in the United States, Israel, and Germany, and has participated in group exhibitions in France and Japan. Granot's works are found in public collections in Israel, Germany, England, and the United States, as well as numerous private collections. Jump to Audio Extra: "Hiddur Mitzvah"
A moshav is a type of cooperative agricultural community found in Israel. Learn more about moshavim in this Wikipedia entry. It is helpful to know a bit about the structure of the Hebrew Bible. Tanakh (Hebrew תַּנַ"ךְ‎) is the Jewish name for the Holy Scriptures. The word Tanach is an acronym formed from the initial Hebrew letters of the text's three subdivisions: Torah (the first five books of the Bible), Nevi'im (the Prophets), and Ketuvim (the Writings). The three sections are arranged in a descending order of holiness. Learn more about Tanakh on Wikipedia and in this introduction to Tanakh from Temple Israel in Minneapolis. Haftarah (Hebrew הפטרה) refers to a portion of the Hebrew Bible chanted publicly in the synagogue during Jewish religious services on the Sabbath and festivals. The haftarah reading is taken from the Prophets and follows the Torah reading, to which it is usually related thematically. Learn more about the history of haftarah on Wikipedia. The haftarah is typically the portion of the Bible chanted by a child becoming a Bar or Bat Mitzvah. See the book Archie Granot created for his son's bar mitzvah here. Listen to audio recordings of haftarah selections here. In contemporary usage the Hebrew word s efer (plural s'farim) can refer to any kind of book, although it often indicates books of the Tanakh, the oral law, or works of Rabbinic literature. A related word is sofer, which originally indicated a scribe but now carries the sense of writer or author. Read a meditation on the root and history of the word sefer here. Explore two online databases of historic and rare seforim here. Haggadah (הַגָּדָה)‎ is Hebrew for "telling," namely, the telling of the Exodus story at the Seder service during the Jewish festival of Pesach, or Passover. The term also signifies a book that contains the ritual guide to the Seder, along with scripture passages, commentary, prayers, and songs. For centuries the haggadah has been one of the most celebrated items of Jewish literature and art, and there are many examples of both handwritten and printed haggadot with intricate illustrations. In each generation artists continue the tradition of reinterpreting the haggadah for contemporary believers. Explore a timeline of the development of the haggadah here. A number of additional online resources about the haggadah and Passover Seder can be found on MOCRA's Papercut Haggadah exhibition website. Scroll down to the "Additional Links" section. Max mentions the openness and inclusivity of the Seder table. Journalists Cokie and Steve Roberts have published Our Haggadah: Uniting Traditions for Interfaith Families. Listen to an interview with them here. Archie Granot, The Papercut Haggadah, page 46. 1998-2007. Collection of Sandra and Max Thurm. Photo by Jeffrey Vaughn. This page is titled "Nirtzah" ("Conclusion of the Seder"). The last line of text is the familiar phrase, "Next year in Jerusalem!" Archie refers to a monthlong conflict during the summer of 2006 between the Israeli military and Hezbollah paramilitary forces. Read more about the conflict on Wikipedia. Blue and white are the colors of the State of Israel, as seen on the Israeli flag. The blue stripes recall the stripes on the tallit, or Jewish prayer shawl. Read more on Wikipedia. Archie Granot, The Papercut Haggadah, page 12. 1998-2007. Collection of Sandra and Max Thurm. Photo by Jeffrey Vaughn. In his notes for this page, titled "Vayered Mitzraimah" ("He Went Down to Egypt"), Archie writes, "The [haggadah] text talks about the slavery in Egypt, so the pyramidal shape of the cut-out text was a natural choice. It sits on a background of paper woven by the artist, giving the impression of an unending brick wall, similar in color to the sand which, the book of Exodus tells us, the people of Israel were forced to use when making bricks." See Exodus 1:8-14 and Exodus 5:6-21. Archie Granot, The Papercut Haggadah, page 2. 1998-2007. Collection of Sandra and Max Thurm. Photo by Jeffrey Vaughn. This page is titled "Bedikat Chametz" ("Searching for Leaven"). Learn more about the search for leaven on the night before Passover here. Traditional haggadot tend to illustrate the activities being described in the text. 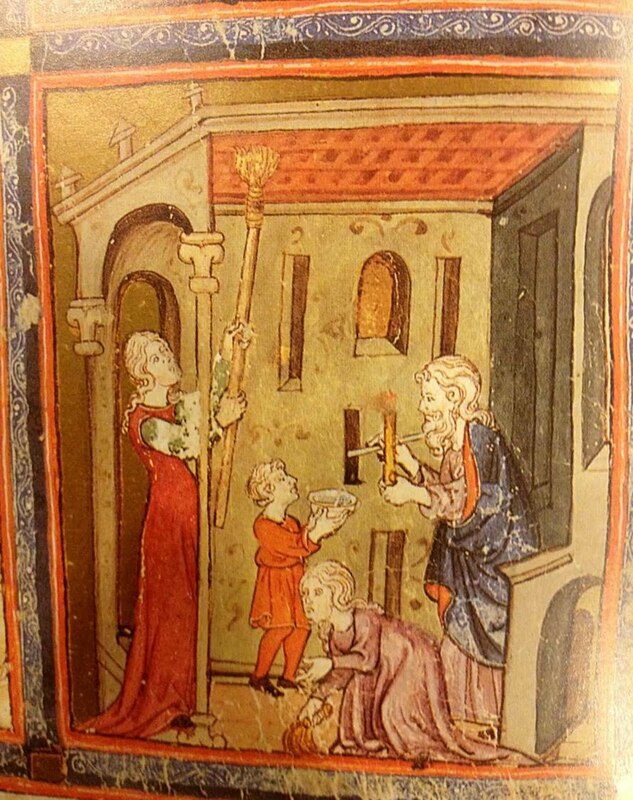 Here is a bedikat chametz image from the Golden Haggadah, c. 1320. Archie Granot, The Papercut Haggadah, page 6. 1998-2007. Collection of Sandra and Max Thurm. Photo by Jeffrey Vaughn. Why does this night differ from all other nights? For on all other nights we eat either leavened or unleavened bread; why on this night only unleavened bread? On all other nights we eat either sitting up or reclining; why on this night do we all recline? Archie Granot, The Papercut Haggadah, page 42. 1998-2007. Collection of Sandra and Max Thurm. Photo by Jeffrey Vaughn. Archie Granot, The Papercut Haggadah, page 13. 1998-2007. Collection of Sandra and Max Thurm. Photo by Jeffrey Vaughn. In his notes on The Papercut Haggadah, Archie notes that the use of mat board in this piece was a breakthrough in the series. He says, "I wanted to capture the very depths of despair and, using board, I cut the edges and built ten layers on the left side and seven layers on the right. These numbers are very significant in Jewish thought." The Decalogue , or Ten Commandments (also translated "the ten words", "the ten sayings" or "the ten matters"), which appear in Exodus 20 and Deuteronomy 5. Explore the various ways in which the imperatives are grouped and numbered here. Traditionally a minyan , or quorum, of ten adult Jewish males is required to recite certain public prayers. Learn more on Wikipedia, and also see this discussion by Rabbi Abraham Millgram. Yom Kippur, or the Day of Atonement, the holiest day of the year for Jews, falls on the 10th of the month of Tishrei. Learn more about Yom Kippur here. The account of creation given in Chapter 1 of Genesis describes a 7-day process. The Jewish tradition accords particular honor to three patriarchs (Abraham, Isaac, and Jacob) and four matriarchs (Sarah, Rebekah, Leah and Rachel). Explore a broad discussion of biblical patriarchs and matriarchs on Wikipedia. Seven blessings, or Sheva Brachot, are a part of traditional Jewish wedding ceremonies and are also recited during the week following the wedding. Learn more about the custom here. The completed work measures over half-an-inch thick. Hermeneutics is the art and science of interpreting texts. An overview of the history and varieties of hermeneutics can be found on Wikipedia. Interpretation of the Bible is its own discipline with a wide range of approaches, as discussed in this Wikipedia article on Biblical hermeneutics. The Stations of the Cross is a set of meditations on various episodes, both scriptural and traditional, in the suffering and death of Jesus. Artistic representations in a variety of media (but usually sculpture or painting) depict each episode and help focus the meditation. Praying the Stations usually entails walking from station to station. Learn more about the history and variations on the Stations of the Cross in this Wikipedia article. Michael Tracy, Triptych: 11th, 12th, and 13th Stations of the Cross for Latin America: La Pasión, 1981-88. Mixed media on canvas with tin. Courtesy of the artist. Shiviti papercut, Poland, 19th c. Source: Dr. Giza Frankel, The Art of the Jewish Papercut. Papercutting has been practiced in cultures across the world, as demonstrated by the Wikipedia entry on the topic. References to a Jewish papercut date from the 14th century, and it became an important folk art among both Ashkenazi and Sephardic Jews. Requiring only simple and readily available tools (paper, pencil and knife), papercutting was available to all, even the poor. Traditional papercuts were highly symmetrical and featured familiar Jewish symbols as well as calligraphic inscriptions. As is evident from the example above, traditional Jewish papercuts could achieve high levels of intricacy and sophistication. They were used to fulfill hiddur mitzvah (embellishing the commandments in an aesthetic way), and could be found in homes and synagogues. This tradition almost disappeared in the first half of the 20th century, due both to emigration and to the Holocaust. During the last 50 years, however, papercut art as a means of Jewish expression has been revived. For example, the ketubah or marriage contract, which serves as a daily reminder of a couple's love, marriage vows and responsibilities to each other, is a frequent subject for contemporary papercuts. Learn more about Jewish papercutting on Archie's website and on the My Jewish Learning website. Learn more about ketubahs and see examples on Archie's website. Archie Granot, The Papercut Haggadah, page 20. 1998-2007. Collection of Sandra and Max Thurm. Photo by Jeffrey Vaughn. This page is titled "B'chol Dor V'dor" ("In Each Generation"). In his commentary on this page, Archie notes, "The text sits on a two-winged papercut. This papercut 'in flight' reflects the soaring spirit attained with the outpouring of praise embodied in the word Hallelujah (הּיָוּללְהַ), with which the text on this page ends. The design was created from the two initial letters of the first names of the husband and wife [Max and Sandra Thurm] who commissioned The Papercut Haggadah." Although in the podcast Archie describes this work as having 23 layers, in the commentary he gives the number as 25. The has 22 letters, five with variant forms and all of them consonants. Vowels are indicated with marks around the letters called niqqud, or vowel points. Hebrew is written from right to left. Written Hebrew dates back more than three millennia and has gone through various stages of evolution. The present script is a stylized version of the Aramaic alphabet. Wikipedia has a detailed discussion of the Hebrew alphabet. More succinct overviews can be read here and here. Hebrew typography remains a vibrant art and fertile ground for new developments, as seen in this blog on the field and this interview about the New American Haggadah with Israeli graphic and type designer Oded Ezer. Archie Granot, The Papercut Haggadah, page 55. 1998-2007. Collection of Sandra and Max Thurm. Photo by Jeffrey Vaughn. of the Thurm family in the United States of America. For ten years I have labored over the excellence of each cut. in the month of Kislev in the year 5768 (2007). A cutting blade is my scribal quill and papercutting is my art. Accomplished and concluded, with thanks to the Lord, Creator of all things. The artist’s signature sits at the base of this page. It is the only signed page in the Haggadah. Archie mentions that one page in The Papercut Haggadah incorporates his initials. It is titled, "Retze, Ya'aleh V'yavo" ("Grace after Meals: Be Pleased, May There Rise"). He notes, "The two central pillars separating these two bless­ings were created from the letters א (Alef) and ג (Gimmel) -- my initials." Archie Granot, The Papercut Haggadah, page 33. 1998-2007. Collection of Sandra and Max Thurm. Photo by Jeffrey Vaughn. Archie also mentions that three pages reference Max and Sandra Thurm. In this example, "The central image of a tower (Thurm in German, Turem in Yid­dish) sits on a design created from the letter ט (Tet). The page is en­cap­sulated by the names of Sandra and Max Thurm as well as the two verses that begin with the first and last letters of their names." For every Hebrew name, there is a corresponding Biblical verse; the first and last letters of the verse are the same as the first and last letters of the Hebrew name. It is said that memorizing this verse will help a person remember his or her name in the afterlife. Archie Granot, The Papercut Haggadah, page 1. 1998-2007. Collection of Sandra and Max Thurm. Photo by Jeffrey Vaughn. Archie Granot, The Papercut Haggadah, page 17. 1998-2007. Collection of Sandra and Max Thurm. Photo by Jeffrey Vaughn. The song "Dayenu " is at least 1,000 years old. Its fifteen verses recall God's astounding acts on behalf of Israel, such as delivering the Israelites from Egypt and for giving the Sabbath and the Torah. Each verse ends with the word Dayenu, meaning "it would have been enough for us" or "it would have sufficed" -- had God given only one of the gifts, it would have still been enough. Archie says of this page, it "has the shape of round hand­made matzah and is executed in blue and white- - the colors of the State of Israel. The word Dayenu repeats itself in the circular design, in the middle of which sits the complete text of this chant." The Hebrew term mitzvah can refer to the divine commandments given in the Torah, or more broadly to moral deeds performed as a religious duty--that is, an act of human kindness. Learn more about mitzvot here.